By far today was my favorite day of the trip. 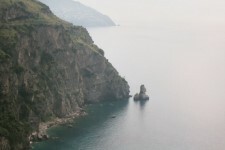 The Amalfi coast is absolutely breathtaking. On Tuesday and Wednesday we saw the great works of man, today we saw the great works of nature. Both are capable of amazing things. We started our trip at the port in Naples. 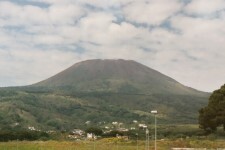 From there we drove past Mt. 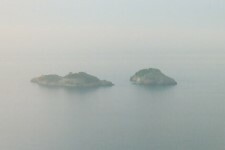 Vesuvius to the road that winds around the Amalfi coast. 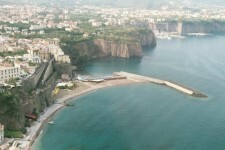 Our first stop along the coast was the town of Sorrento. 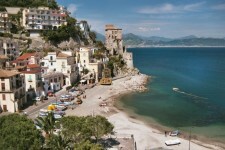 Sorrento is a small town along the Amalfi coast that has many interesting shops. From where we were in Sorrento you couldn't see the ocean. Our tour bus dropped us off at Cuomo's Lucky Store where they make inlaid wood and porcelain products. They had a really beautiful collection of jewelry and music boxes, but it was all rather expensive. We were supposed to see a demo of how they make the inlaid wood products but either they never did it or I somehow missed it. After spending some time in the shop everyone left to walk down the street and do some more shopping. Sorrento's a nice town, but it certainly wasn't my favorite on this trip. Positano was my favorite of the towns we visited today. 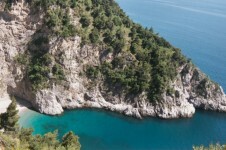 It's built directly into a cliff with beautiful views and a nice beach at the bottom. There's lots of interesting shops, including many selling art work, nice restaurants, and places to just sit and relax. 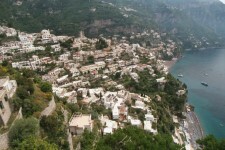 Positano is a walking town and the few roads that allow automobile traffic are too narrow for the tour bus. From the tour bus we took a small local bus that drove us down to the main walkway. From there we walked past many shops until we arrived at the beach. Along the beach there are many restaurants and cafés and on the beach there's rows of umbrellas and lounge chairs. It's too bad we didn't have more time, because this is definitely a vacation spot. 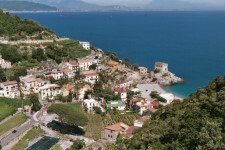 Amalfi is similar to Positano, but didn't seem as large and wasn't as picturesque. 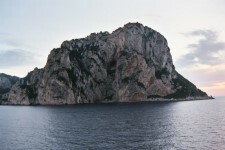 Just before dinner as the ship was leaving port we passed the island of Capri on the starboard side of the ship. 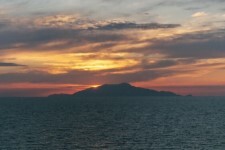 There was a beautiful sunset that made for some very dramatic pictures of Capri. I tried to get a shot of Capri's lighthouse, but it didn't turn out as well as I had hoped.